You can also download the entire Cymbeline translation as a PDF! PHILARIO, IACHIMO, a FRENCHMAN, a DUTCHMAN, and a SPANIARD enter. Believe it, sir, I have seen him in Britain: he was then of a crescent note, expected to prove so worthy as since he hath been allowed the name of; but I could then have looked on him without the help of admiration, though the catalogue of his endowments had been tabled by his side and I to peruse him by items. Believe me, sir, I have seen him in Britain. He was still growing up, and people expected him to become just as virtuous as they say he eventually became. But I wasn't impressed by him, and wouldn't have been even if there had been a list of all his good qualities near him and I had to read each item on the list and consider it independently. You speak of him when he was less furnished than nowhe is with that which makes him both without and within. But you're talking about what he was like when he didn't yet have all the qualities, inner and outer, that he does now. I have seen him in France: we had very many therecould behold the sun with as firm eyes as he. I have seen him in France. He couldn't look straight at the sun any more easily than other people could. This matter of marrying his king's daughter, whereinhe must be weighed rather by her value than his own,words him, I doubt not, a great deal from the matter. This business of him marrying his king's daughter makes him seem better than he is, because she's worth far more than he is and people have to judge him by her worth. Ay, and the approbation of those that weep this lamentable divorce under her colours are wonderfully to extend him; be it but to fortify her judgment, which else an easy battery might lay flat, for taking a beggar without less quality. But how comes it he is to sojourn with you? How creeps acquaintance? Yes, and the people who cry about this separation because they're loyal to her say amazing things about him. This is just to make her seem wiser because otherwise you could easily criticize her for marrying a worthless beggar. Why is he coming to stay with you? How do you know each other? His father and I were soldiers together; to whom I have been often bound for no less than my life. Here comes the Briton: let him be so entertained amongst you as suits, with gentlemen of your knowing, to a stranger of his quality. His father and I were soldiers together, and he often saved my life. Here comes the British man. Treat him as well as men of your class should treat such a noble stranger. I beseech you all, be better known to this gentleman; whom I commend to you as a noble friend of mine: how worthy he is I will leave to appear hereafter, rather than story him in his own hearing. Please, get to know this man. You should because he's a noble friend of mine. Instead of bragging about how great he is in front of him, I'll let it become clear later. Sir, we have known together in Orleans. Sir, we met in Orleans. Since when I have been debtor to you for courtesies,which I will be ever to pay and yet pay still. And since we met you've done me many favors and I owe you a lot for that. I'll always owe you and will never be able to repay the full amount. Sir, you o'er-rate my poor kindness: I was glad I did atone my countryman and you; it had been pity you should have been put together with so mortal a purpose as then each bore, upon importance of so slight and trivial a nature. Sir, you're making too much of what was simple kindness. I was glad to make peace between you and my countryman. It would have been a pity if you had attacked each other in such a deadly way, which is what you wanted to do, over such an unimportant matter. By your pardon, sir, I was then a young traveller; rather shunned to go even with what I heard than in my every action to be guided by others' experiences: but upon my mended judgment—if I offend not to say it is mended—my quarrel was not altogether slight. You see, sir, I was not an experienced traveler then. I was stubborn and did the opposite of what people told me I should do based on their own experiences. But even though I am wiser now, if I do say so myself, I don't think the argument was over an unimportant matter. 'Faith, yes, to be put to the arbitrement of swords,and by such two that would by all likelihood haveconfounded one the other, or have fallen both. It was extreme to try to settle it by fighting with swords, especially since you would probably have hurt or killed each other. Can we, with manners, ask what was the difference? Would it be rude for us to ask what the argument was about? Safely, I think: 'twas a contention in public, which may, without contradiction, suffer the report. It was much like an argument that fell out last night, where each of us fell in praise of our country mistresses; this gentleman at that time vouching—and upon warrant of bloody affirmation—his to be more fair, virtuous, wise, chaste, constant-qualified and less attemptable than any the rarest of our ladies in France. No, it's fine. It was a public argument and so no one would think it was wrong to tell you about it. It was a lot like an argument we had last night when we all raved about our girlfriends at home. This man, Posthumus, was saying that his girlfriend was more beautiful, a better person, wiser, less sexual, better in every way, and less easy than than even the best women in France, and he threatened to fight anyone who disagreed. That lady is not now living, or this gentleman'sopinion by this worn out. I'm sure that either that woman is dead or this man has changed his mind about her. She holds her virtue still and I my mind. She still has all her virtues and I still have the same opinion about her. You must not so far prefer her 'fore ours of Italy. But you wouldn't say she was that much better than our women here in Italy. Being so far provoked as I was in France, I wouldabate her nothing, though I profess myself heradorer, not her friend. If I got as worked up as I did in France, I would not take away any of the things I said about her. I would add that I am her admirer, not her equal. As fair and as good—a kind of hand-in-hand comparison—had been something too fair and too good for any lady in Britain. If she went before others I have seen, as that diamond of yours outlustres many I have beheld. I could not but believe she excelled many: but I have not seen the most precious diamond that is, nor you the lady. Even if you put her hand in hand with our women here by saying she was as beautiful and as good as they are, you would still be describing her as too beautiful and too good to be a British woman. Maybe this would be true if she were better than others I have seen, just as that diamond of yours is brighter than many I have seen. Then I would have to believe that she was better than many women. But I have not seen the most precious diamond that exists, and you have not seen the most precious woman who exists. I praised her as I rated her: so do I my stone. I described her as I saw her then, and I would do the same thing with my diamond. What do you esteem it at? How much do you think it's worth? More than the world enjoys. More than is contained in the world. Either your unparagoned mistress is dead, or she'soutprized by a trifle. Either your unequaled lover is dead or she's worth less than a trinket. You are mistaken: the one may be sold, or given, if there were wealth enough for the purchase, or merit for the gift: the other is not a thing for sale, and only the gift of the gods. You're wrong. One of them can be sold or given away, or it could if anyone had enough money to buy it, but the other is not a thing that's for sale, and can only be given away by the gods. Which the gods have given you? Which the gods have given to you? Which, by their graces, I will keep. Which, if they let me, I will keep. You may wear her in title yours: but, you know, strange fowl light upon neighbouring ponds. Your ring may be stolen too: so your brace of unprizable estimations; the one is but frail and the other casual; a cunning thief, or a that way accomplished courtier, would hazard the winning both of first and last. You are entitled to her now and can wear her. But, you know, unfamiliar birds land on familiar ponds. Your ring could be stolen, and so could your string of high opinions of her. One is weak and the other is temporary. A clever thief, or a courtier good at that sort of thing, would take the bet that they could win both things. Your Italy contains none so accomplished a courtier to convince the honour of my mistress, if, in the holding or loss of that, you term her frail. I do nothing doubt you have store of thieves; notwithstanding, I fear not my ring. Your Italy doesn't hold a courtier talented enough to convince my wife to sleep with him, if you mean by saying she's "weak" that being loyal makes her weak or that she's easily convinced to be disloyal. I don't doubt that there are plenty of thieves here, but I'm not worried I'll lose my ring. Let us leave here, gentlemen. Sir, with all my heart. This worthy signior, Ithank him, makes no stranger of me; we are familiar at first. Gladly, sir. This good man doesn't treat me like a stranger. We're being very informal, and I thank him for that. With five times so much conversation, I should get ground of your fair mistress, make her go back, even to the yielding, had I admittance and opportunity to friend. With only five times the amount of conversation we've had, I would defeat your wife and make her retreat and finally yield to me, if I could just get into her presence and was given the opportunity. I dare thereupon pawn the moiety of my estate to your ring; which, in my opinion, o'ervalues it something: but I make my wager rather against your confidence than her reputation: and, to bar your offence herein too, I durst attempt it against any lady in the world. I'm willing to bet half of my property against your ring, which in my opinion is more than the ring is worth. It's your confidence, not her reputation, that makes me think I'll win. Don't be offended: I would try this with any woman in the world. You are a great deal abused in too bold a persuasion; and I doubt not you sustain what you're worthy of by your attempt. You're wrong to be so sure of yourself. I don't doubt that if you try to do this you'll get what you have coming to you. A repulse: though your attempt, as you call it,deserve more; a punishment too. A refusal. Though your "try," as you call it, deserves more: a punishment. Gentlemen, enough of this: it came in too suddenly;let it die as it was born, and, I pray you, bebetter acquainted. Gentlemen, that's enough. This started too quickly. Let it end just as quickly, and please, make friends with each other. Would I had put my estate and my neighbour's on theapprobation of what I have spoke! I wish I had bet both my property and my neighbor's to prove what I said! What lady would you choose to assail? What woman would you choose to harass? Yours; whom in constancy you think stands so safe. I will lay you ten thousand ducats to your ring, that, commend me to the court where your lady is, with no more advantage than the opportunity of a second conference, and I will bring from thence that honour of hers which you imagine so reserved. Your wife, who you're so sure is loyal. If you send me with a letter of recommendation to the court where your wife is, with just one opportunity to talk to her a second time, then I bet you ten thousand ducats against your ring that I will take her honor, which you think is so safe, and bring it back with me. I will wage against your gold, gold to it: my ringI hold dear as my finger; 'tis part of it. I'll bet you gold against your gold instead. My ring is as important to me as my finger. It's part of it. You are afraid, and therein the wiser. If you buy ladies' flesh at a million a dram, you cannot preserve it from tainting: but I see you have some religion in you, that you fear. You're afraid, and that's wise of you. Even if you buy women's bodies at a million ducats per ounce, you can't keep them from going bad. I see you're afraid of your wife as though she's your god. This is but a custom in your tongue; you bear agraver purpose, I hope. That's just the way you talk. I hope you're actually more serious and don't really mean this. I am the master of my speeches, and would undergowhat's spoken, I swear. I'm in control of what I say, and I promise I'm willing to go through with what I've said. Will you? I shall but lend my diamond till your return: let there be covenants drawn between's: my mistress exceeds in goodness the hugeness of your unworthy thinking: I dare you to this match: here's my ring. Will you? I'll just lend you my ring until you come back. Let's draw up a contract. My wife is so much better than your worthless mind can understand. I dare you to try this. Here's my ring. I will have it no lay. I won't let this bet happen. By the gods, it is one. If I bring you no sufficient testimony that I have enjoyed the dearest bodily part of your mistress, my ten thousand ducats are yours; so is your diamond too: if I come off, and leave her in such honour as you have trust in, she your jewel, this your jewel, and my gold are yours: provided I have your commendation for my more free entertainment. By the gods, it's a bet. If I don't bring you good enough evidence that I've taken advantage of your wife's most pleasant body part, my ten thousand ducats will be yours. Your diamond will be yours too. If I come back and she's still as honorable as you believe her to be now, she (your jewel), this ring (your jewel), and my gold will all be yours. If, that is, you send a letter telling her to spend time with me. I embrace these conditions; let us have articles betwixt us. Only, thus far you shall answer: if you make your voyage upon her and give me directly to understand you have prevailed, I am no further your enemy; she is not worth our debate: if she remain unseduced, you not making it appear otherwise, for your ill opinion and the assault you have made to her chastity you shall answer me with your sword. I accept these conditions. Let's draw up an agreement. I would only add that this should be your penalty: if you try to seduce her and tell me clearly that you succeeded, I will not be your enemy any more. She will not be worth arguing about. If you can't tell me she was seduced, I will challenge you to a sword-fight for your bad opinion of her and your attack on her loyalty. Your hand; a covenant: we will have these things set down by lawful counsel, and straight away for Britain, lest the bargain should catch cold and starve: I will fetch my gold and have our two wagers recorded. Let's shake on it. It's a deal. We'll have a lawyer write these things down, and I'll head to Britain immediately before the deal dies of a cold. I'll get my gold and have our bets written down. POSTHUMUS LEONATUS and IACHIMO exit. Will this hold, think you? Do you think they'll go through with this? Signior Iachimo will not from it.Pray, let us follow 'em. Iachimo won't let it go. Come on, let's follow them. Doyle, Clio. "Cymbeline Translation." LitCharts. LitCharts LLC, 19 May 2017. Web. 25 Apr 2019. Doyle, Clio. "Cymbeline Translation." LitCharts LLC, May 19, 2017. Retrieved April 25, 2019. https://www.litcharts.com/shakescleare/shakespeare-translations/cymbeline. 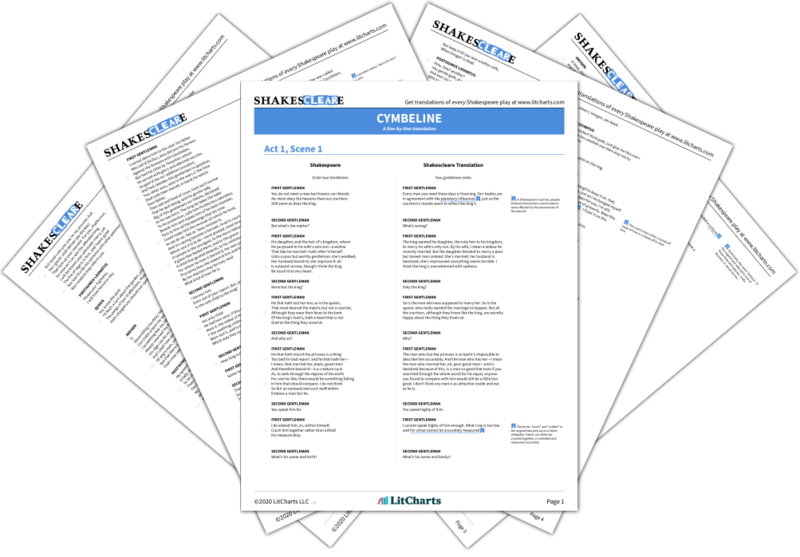 Join LitCharts A+ and get the entire Cymbeline Translation as a printable PDF.